Wow, its pre-race day already! How fast did that go…..
Today I don’t plan to do too much, I am going to try to relax, do things that will take my mind off the event….maybe weed the course or wax my webs, for aerodynamic purposes only you understand. I wonder if my personal trainer Michelle Green can fit me in? Michelle is a qualified Sports Massuer and believe me, she can knead the knots out of anything. There is one thing I do need to do though, that said! I need to check my kit, make sure I’ve got everything ready, try it on so I am prepared. High-technology swimwear fabrics are scientifically advanced materials used for swimwear in competitive water sports such as swimming and triathlon. 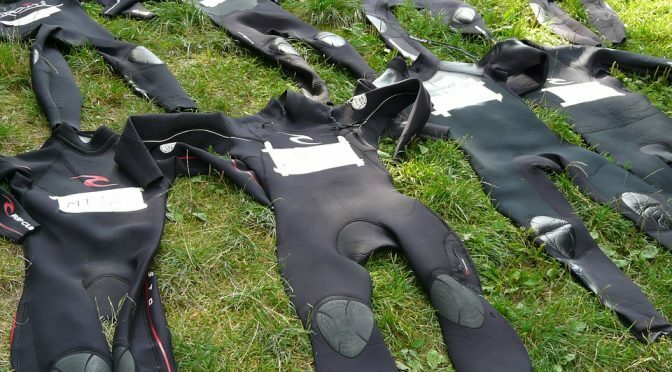 Materials of this type are normally spandex and nylon composite fabrics with features to reduce drag against the water. The fabrics include features that increase the swimmer’s glide through the water (said to mimic marine animal skin) and reduce the absorption of water by the suit as opposed to regular swimsuits. For example, Speedo claims their line up will increase one’s swimming speed by 3–7%. The other thing I need to think about is how I’ll be getting there, so there’s no panic on the day. Duck HQ is the FOSS store cupboard at Storrington First School and normally we get a lift with the lovely mummies, daddies and teachers who help make the day such a success. So, if you have a few hours spare on Sunday morning, please let Sharon or Delia know as we would love some help getting all of us ducks, gazebo’s and stuff to the Riverside Walk PLUS you get first choice on the cake stall but shhhhh, I didn’t tell you that. So, all that remains is to say see you there and I hope you have a great day! Look out for me and all my chums thrashing down the stream to racing success for the good cause that is Storrington First School…. Previous PostLess than a week to go!Next PostIt’s the big day today! Fancy a waddle? You would be Quackers to miss it!